At The National Breast Cancer Coalition every bit of business we do begins with a moment of silence (MOS) to remember an incredible breast cancer advocate who has died since our last gathering. The MOS grounds us and reminds us about why we are there. And every day as I sit down to my desk to write, I look at the faces of all the women I know who have died of breast cancer. I also, in some cases, look at the faces of their children, because I know that I want to end breast cancer because they are without their mothers. The work of The National Breast Cancer Coalition is very focused as we have set a deadline to end breast cancer by January 1, 2020 and we know that from now until then every thing we do must further us in finding a way to prevent breast cancer and the metastasis of breast cancer to the rest of the body. If we can accomplish those two things, we can end breast cancer. It is not a small, easily achievable goal. But it’s never been attempted before and if anyone can do it, it is the National Breast Cancer Coalition. With your help of course! The National Breast Cancer Coalition hosts the best annual educational conference for people affected by breast cancer. It is the Advocacy Summit, this year held May 5-8th in Arlington, Virginia. It is three days of education that culminates in a lobby day on Tuesday, May 8th where we visit with congressional representatives and gain their support in order to accomplish our deadline. I hope you can join us there! NBCC has been successful in raising more than 2.68 billion dollars for the Department of Defense Breast Cancer Research Program. It was NBCC that turned a federal screening program into a screening and treatment program. We were lobbying for Access to Healthcare for All long before the passing of the Affordable Healthcare Act. Just when I thought I had no way to defeat the disease that was killing so many of my friends, I joined NBCC. In 1998, I graduated from their Project LEAD (Leadership Education Advocacy Development) Program and empowered myself to become a part of the solution. LEAD teaches its graduates to be informed survivors who represent all women affected by breast cancer and it gives them the skills necessary to influence stakeholders by sitting at important decision making tables. Since my LEAD education I have testified before the senate, participated in peer review, and contributed to national committees at the Institutes of Medicine and the CDC. My peers have testified before the FDA, contributed in designing clinical trials and insuring that they are properly designed and ask the best possible questions. 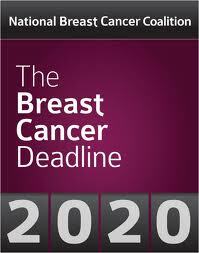 NBCC is asking everyone to get involved with Breast Cancer Deadline 2020. We need all stakeholders involved. Clinicians, Researchers, Legislative Representatives, the President, Musicians, Statisticians, Writers, Strategists and You! Bring what you do to the effort to end breast cancer. Sign the petition to the president, attend the Advocacy Summit, May 5-8th and then ask your friends to do what they can so that we can all say that we ended breast cancer. Finally a deadline for all of us to work toward. It’s now posted on my Facebook page. Participating in the process is the only way to effect change and there is so much to be done! I’ll be tweeting from the Hill tomorrow…can’t wait!!! This wonderful and inspiring. Is this the woman who recognized you as a force of nature and helped you gain a seat at the table discussing these issues at the Department of Defense? There are SO many women at NBCC who have inspired me! Tomorrow I will join them on the Hill, with 7 meetings and 2 drop-in on California House members! There are SO MANY women at NBCC who have inspired me, and I would not be doing the DOD if it weren’t for them, to be sure! It is not unlike standing in the eye of a hurricane with energy flying past in every direction.